Citations document source information used in research. They add credibility to your work by showing where your information came from and give proper credit to the source material. Knowing where to find and how to read citations will also help you significantly with your own research by pointing you towards ready sources of relevant information. As you gather information to use in your research paper, it is important to keep track of where you found it. Your work should include a bibliography of all the sources you used, which you will also reference whenever you use information from them. 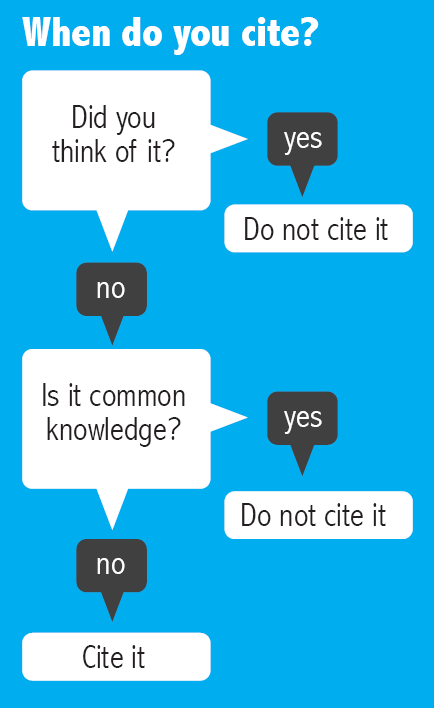 You do not need to cite your own ideas or any information that is considered common knowledge. Everything else must be properly credited, using a commonly accepted citation style. What does a Book citation include? This information will help other readers to locate the book. What does an Article citation include? This information will help other readers to locate the article. Cite This For Me -- A fast and free way to create your bibliography, reference list, or works cited list using APA, Chicago, or MLA citations styles. A Libguide on visual literacy. Bibliographic Management Software - Try this LibGuide for information about different software programs that will help you to create a bibliography and keep track of citations. BMS Comparison - Which one should you use? This chart compares the different bibliographic management software progams to help you decide which will work best for you.